Greetings from HumanaNatura on the cross-quarter! Today marks the halfway point between the extreme light and darkness of the last solstice and the more balanced time on earth that is the coming equinox. This transitional time is a great opportunity to ensure steady progress on your Natural Life Plan, acting on your immediate goals to improve your health and quality of life and preparing for our recommended twice-yearly review of your plan at the equinox. If you do not yet have a Natural Life Plan – guiding your personal expression of the HumanaNatura technique of Natural Living – the link above will take you to our planning worksheets and get you started. Our newest community newsletter was released today as well, which is published eight times yearly in harmony with the natural year. To receive future HumanaNatura newsletters and learn about the benefits of community membership, go to Join HumanaNatura. 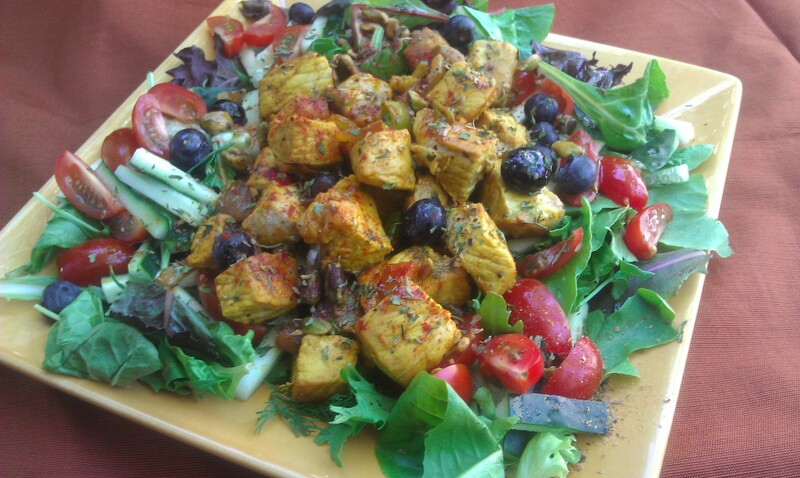 Love one or more ethnic cuisines, but want to eat healthier than many of our traditions allow? The solution is a fusion of the old world and new natural. 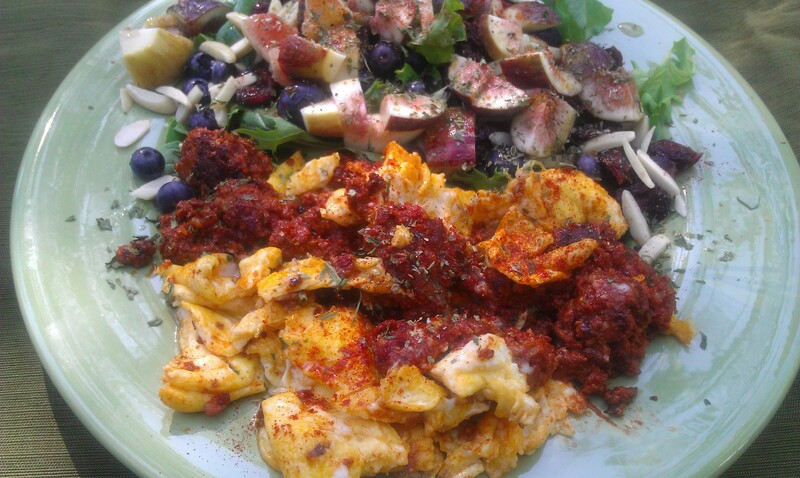 Here we have mixed spicy Latin chorizo and eggs with greens, berries, and sliced figs, creating a hearty meal that is alternatingly hot and cool with each bite…it’s garnished with slivered almonds, parsley, paprika, cumin, marjoram, and just a bit of red pepper. Bonito! A new study published by the American Heart Association (AHA) underscores the high natural health leverage that we gain via even modest daily exercise. The new study examined total amount of daily exercise across the AHA’s large sampling base and found that even 10-15 minutes a day of light aerobic activity, an amount below AHA and HumanaNatura guidelines, has a substantial impact on cardiovascular health risks. The new research underscores the important dangers associated with unnatural sedentary living and is a good reminder of the powerful health and life impacts we gain through a commitment to daily exercise. Learn more about the new study at Small Amounts Help or view a slideshow containing HumanaNatura’s exercise guidelines at About HumanaNatura. 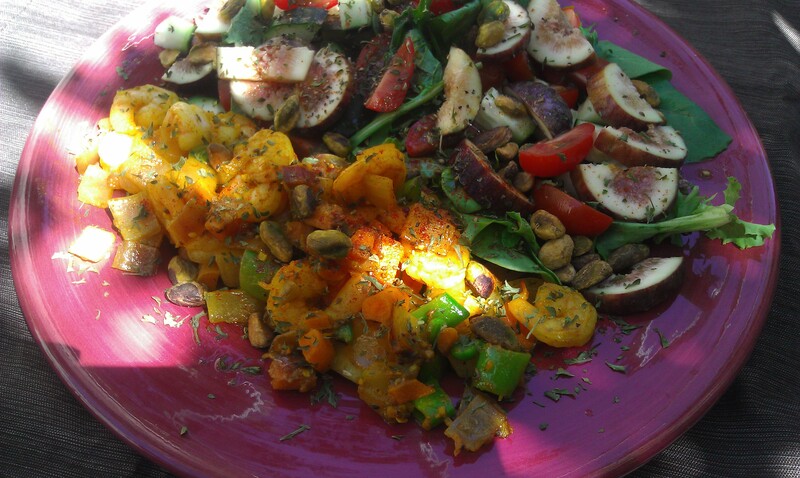 Spicey curry shrimp and diced veggies with baby greens, cucumbers, tomatoes, and the season’s first fresh figs…garnished with pistachios, parsley, coriander, anise, and black pepper…Mmmm!